There is a famous book which interprets the fourteenth century as the time when the Middle Ages finally went to seed like the crops in Autumn. Another describes it as ‘the calamitous fourteenth century’. Small wonder, therefore, if the music composed in France during the century of Guillaume de Machaut (d1377) has often been described as ‘mannerist’ and ‘precious’: terms that suggest decadence and escapism. The performances recorded here spring from a different view of French music during the fourteenth century, for we believe that French song of the later Ars Nova can be described by a term that is both positive and evocative: Romantic. To be sure, these songs have been called Romantic before, but it may still seem rash to speak of ‘The Medieval Romantics’. Devotees of nineteenth-century music will object that there was no cult of genius in the fourteenth century, no passion for the wildness of Nature and no such nationalism as we associate with the 1800s. 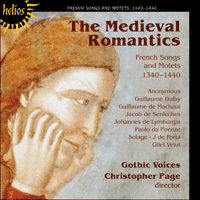 And yet if Romanticism implies a taste for beauty touched by strangeness, and if it is associated with a desire to expand the resources of musical language (and especially of harmony) with sheer profligacy of invention, then the second half of the fourteenth century in France was truly a period of Romantic composition. This is not to say that every composer of the period was a Romantic artist. Most of the polyphonic songs produced in France between c1340 and c1400 are light and melodious, being neither ‘wayward’ (a term often used of this repertory) nor Romantic. The virelai Mais qu’il vous viengne a plaisance is a representative example of this style at its best. Nonetheless, in addition to these plainer songs we find others, many of them attributed to named composers, which reveal different priorities. With the Romanticism of the fourteenth century—as with that of the nineteenth—a major priority is the sheer scale of what is attempted. To hear a thirteenth-century motet such as Quant voi le douz tans/En Mai/[Immo]LATUS, followed immediately by the four-part motet Alma polis religio/Axe poli/Tenor/Contratenor of the next century, is to sense that there has been a great expansion in the musical territory colonized for composition. The later work is longer, its harmonic language more studied but also more diversified, and its compass much wider (reaching two octaves, the limit of the human voice according to contemporary theorists). With its complex isorhythmic scheme, it is altogether a more grandiose and intellectually ambitious work than its thirteenth-century counterpart. In the chanson repertoire of rondeaux, virelais and ballades, where the Romanticism of the later Ars Nova is principally to be found, the desire for expansive musical conceptions was closely allied (as it was to be five hundred years later) to an enlarged conception of melody. As early as the twelfth century, of course, some monophonic songs of the trouvères (not to mention some Latin songs) had been supplied with expansive, melismatic melodies, but the desire to stretch a long, measured melody over a large polyphonic frame was new in the fourteenth century. Among French composers of the Ars Nova this produced compositions going far beyond what could be accomplished in a thirteenth-century piece such as the motet just mentioned, Quant voi le douz tans/En Mai/[Immo]LATUS. In that piece, as it is performed on this recording, we hear first a monophonic song with its roots in the trouvère tradition, and then the same song as it was given mensural rhythm and placed above a vocalized tenor to make a motet, perhaps around 1240. As far as we can discern—for the origins of the polyphonic chanson in the fourteenth century are still obscure—this is one of the textures which passed to the fourteenth century and which helped to form the basis of chansons such as Guillaume de Machaut’s Tant doucement me sens emprisonnes, here performed as a duet comprising the Cantus and (vocalized) Tenor to display the mastery of Machaut’s two-part technique. The comparison with the thirteenth-century motet shows that the musical scope of Machaut’s piece is much greater than the Triplum–Tenor duet of the motet, largely because Machaut’s Cantus is so vast and needs so little support from the text. The thirteenth-century composer works syllable by syllable, but Machaut’s melismatic melody is directed, in particular, by a rhythmic elasticity which is entirely new to the fourteenth century and which merits comparison with some of the freedoms that were also ‘new’ in the nineteenth. We hear this freedom again in the highly flexible melodic line of the anonymous virelai Je languis d’amere mort, or in the Cantus of Paolo da Firenze’s Sofrir m’estuet et plus non puis durer. Paolo’s piece demonstrates that the supposedly wayward rhythms of fourteenth-century song can be lyrical, even lilting, in their effect upon the ear, however strange they may look to the eye. In a similar way, the phrase-lengths in the Cantus of Quiconques veut d’amors joïr, a superb piece by an anonymous master, are so supple that they resist ‘the tyranny of the bar line’ at every turn. There were many experiments with harmony among the medieval Romantics. As we leave the thirteenth century and enter the fourteenth century we become more confident that unusual harmonic effects may be tokens of a colouristic interest in harmony rather than the by-products of a compositional method. That kind of interest in harmony could coexist with the cerebral and calculating tendencies of all medieval composing, and indeed it could be advanced by them. The composer of Alma polis religio/Axe poli/Tenor/Contratenor, for example, is fascinated by a chord of Bb–G–D–G, and he exploits his isorhythmic scheme in such a way that the top three notes sound alone—so that the ear processes a simple chord of G—and then the low B flat enters in the Contratenor to tint the sonority in a most unexpected way. Many other examples could be cited from the pieces recorded here, but the master in this art is Solage, a composer who has left only ten securely attributed works, all of them experimental in various ways, and a high proportion of them in four parts (relatively rare in the chanson repertoire of the Ars Nova). His virelai Joieux de cuer en seumellant estoye, in four parts, is perhaps the summit of fourteenth-century Romanticism. The Cantus—the only part bearing the text—is a vast melody both in terms of its length and its width; it regularly spans a tenth or an eleventh within a few measures, a distance acknowledged by fourteenth-century theorists such as Jacques de Liège to represent the workable (if not the absolute) limit of the human voice. The other three parts are highly vocal in character, or in contemporary terminology, dicibilis (literally ‘pronouncable’). It is the essence of Solage’s achievement in this piece that the textless parts seem to strain towards the beauty and sufficiency of Cantus-style melody. What signs are there that medieval composers recognized that the later fourteenth century had produced composers of profligate inventiveness—musicians who had lent a touch of strangeness to beauty? The surest indication that composers of the fifteenth century recognized that something very striking had happened in the recent past is to be found in the kinds of pieces that they chose to produce themselves. The highly controlled scale and harmonic language of chansons such as Dufay’s Je requier a tous amoureux, the same composer’s Las, que feray? Ne que je devenray? or Gilet Velut’s Je voel servir plus c’onques mais, are characteristic of much early fifteenth-century secular music and may be interpreted as a reaction against the luxuriance of later fourteenth-century composers such as Solage. When we turn to a mature composition of the mid-1430s, Johannes de Lymburgia’s Tota pulcra es, amica mea, we find a four-part technique completely unlike that of Solage. Lymburgia’s harmony is rigorously controlled so that almost every vertical sonority is a consonance, thirds and sixths are crucial building blocks of the music and fleeting rests are inserted in the texture to avoid dissonant colours that the ‘Medieval Romantics’ would have prized. Il existe un livre célèbre qui définit le quatorzième siècle comme la période où le Moyen Age commença finalement à monter en graine, comme les plantes en automne. Un autre le décrit comme «le calamiteux quatorzième siècle». Il ne faut donc pas s’étonner que la musique composée en France durant le siècle de Guillaume de Machaut (m1377) a souvent été décrite comme «manièriste» et «affectée»: termes qui suggèrent décadence et évasion. Les interprétations qui sont enregistrées ici proviennent d’une opinion différente sur la musique française du quatorzième siècle, car nous croyons que la chanson française de la fin de l’Ars Nova mérite d’être décrite par un terme à la fois positif et évocatif: Romantique. Bien sùr, ces chansons ont déjà été appelées romantiques, mais il peut sembler encore imprudent de parler des «Romantiques médiévaux». Les fervents de la musique du dix-neuvième siècle objecteront que le quatorzième siècle n’avait pas le culte du génie, pas de passion pour la Nature sauvage et aucun nationalisme tel que nous l’associons aux années 1800. Et pourtant si le Romantisme sous-entend un penchant pour une beauté teintée d’étrangeté, et s’il est associé à un désir d’ajouter aux ressources du langage musical (et surtout de l’harmonie) avec une pure prodigalité d’invention, alors la seconde moitié du quatorzième siècle en France fut vraiment une période de composition romantique. Cela ne veut pas dire que tous les compositeurs de cette période étaient des artistes romantiques. La plupart des chansons polyphoniques écrites en France entre environ 1340 et 1400 sont mélodieuses et légères, ni «capricieuses» (terme qui revient souvent dans ce répertoire) ni romantiques. Le virelai Mais qu’il vous viengne a plaisance est un parfait exemple du meilleur de ce style. Néanmoins, nous trouvons, outre ces chansons plus simples, d’autres chansons—beaucoup attribuées à des compositeurs connus—qui révèlent des priorités différentes. Pour le Romantisme du quatorzième siècle—comme pour celui du dix-neuvième—une des priorités les plus importantes était la pure envergure de ce qui était tenté. Entendre un motet du treizième siècle comme Quant voi le douz tans/En Mai/ [Immo]LATUS, et immédiatement ensuite le motet en quatre parties Alma polis religio/Axe poli/Tenor/Contratenor qui date du siècle suivant, est une expérience qui nous permet de réaliser la grande expansion qui s’est produite dans le territoire musical colonisé pour la composition. L’ouvrage ultérieur est beaucoup plus long, son langage harmonique plus étudié mais aussi plus diversifié, et son étendue beaucoup plus large (elle atteint deux octaves, limite que les théoristes contemporains accordaient à la voix humaine). Avec son schéma isorythmique complexe, c’est un ouvrage sans aucun doute beaucoup plus grandiose et intellectuellement ambitieux que sa contrepartie du treizième siècle. Dans le répertoire de rondeaux, virelais et ballades où nous trouvons principalement le Romantisme de la fin de l’Ars Nova, le désir de larges conceptions musicales est joint (tout comme cela le sera cinq cents ans plus tard) à une conception élargie de la mélodie. Dès le douzième siècle, bien entendu, quelques chansons monophoniques des trouvères (sans parler de quelques chansons latines) avaient eu de larges mélodies mélismatiques, mais le désir d’étirer une longue mélodie rythmée sur un large cadre polyphonique était une nouveauté pour le quatorzième siècle. Parmi les compositeurs français de l’Ars Nova, cela donna des compositions qui étaient bien au-delà de ce qui pouvait être accompli dans un morceau du treizième siècle, comme le motet déjà mentionné, Quant voi le douz tans/En Mai/[Immo]LATUS. Dans ce morceau, tel qu’il est interprété dans cet enregistrement, nous entendons d’abord une chanson monophonique dont la source est solidement dans la tradition trouvère, puis la même chanson avec son rythme cadencé et placé au-dessus d’un ténor vocalisé pour en faire un motet, peut-être vers 1240. Pour autant que nous pouvons discerner—car les origines de la chanson au quatorzième siècle sont encore très obscures—ceci est une des textures qui sont passées au quatorzième siècle et qui ont aidé à former la base de chansons comme le Tant doucement me sens emprisonnes de Guillaume de Machaut, qui est interprété ici comme un duo, comprenant le Cantus et le Ténor (vocalisé) pour démontrer la maîtrise de la technique de deux parties de Machaut. La comparaison avec le motet du treizième siècle montre que la portée musicale du morceau de Machaut est beaucoup plus grande que le duo Triplum-Ténor du motet, principalement parce que le Cantus de Machaut est si vaste et demande si peu de soutien au texte. Le compositeur du treizième siècle travaille syllabe par syllabe, mais l’élasticité rythmique qui dirige tout particulièrement la mélodie mélismatique de Machaut est entièrement nouvelle au quatorzième siècle et mérite d’être comparée à quelques-unes des libertés qui étaient aussi «nouvelles» au dix-neuvième. Nous entendons de nouveau cette liberté dans la ligne mélodique si flexible du virelai anonyme Je languis d’amere mort, ou dans le Cantus de Sofrir m’estuet et plus non puis durer de Paolo da Firenze. Le morceau de Paolo démontre que les rythmes supposés capricieux du quatorzième siècle peuvent avoir un effet lyrique, même cadencé, sur l’oreille, malgré l’aspect étrange qu’ils offrent à qui les lit. De même, les longueurs de phrases dans le Cantus de Quiconques veut d’amors joïr, morceau splendide par un maître anonyme, sont si souples qu’elles résistent à tout instant, à «la tyrannie de la barre de mesure». Il y eut de nombreuses expériences avec l’harmonie parmi les Romantiques médiévaux. En quittant le treizième et en entrant dans le quatorzième siècle, nous devenons plus sûrs que les effets harmoniques inusités peuvent être des marques d’un intérêt coloristique de l’harmonie plutôt que des conséquences d’une méthode de composition. Cette sorte d’intérêt dans l’harmonie peut coexister avec les tendances cérébrales et calculatrices de toute la composition médiévale et en fait celles-ci pourraient le faire progresser. Le compositeur d’Alma polis religio/Axe poli/Tenor/Contratenor est par exemple fasciné par l’accord de si bémol–sol–ré–sol, et il exploite son schéma isorythmique de telle sorte que les trois notes aigües résonnent seules—de sorte que l’oreille entend un simple accord en sol—puis le si bémol bas entre dans le Contraténor pour nuancer la sonorité d’une façon tout à fait inattendue. On pourrait citer de nombreux autres exemples tirés des morceaux enregistrés ici, mais le maître de cet art est Solage, compositeur qui n’a laissé que dix ouvrages qui lui sont sûrement attribués, tous expérimentaux d’une manière ou d’une autre, et dont une grande proportion sont en quatre parties (ce qui est relativement rare dans le répertoire des chansons de l’Ars Nova). Son virelai Joieux de cuer en seumellant estoye, en quatre parties, est peut-être l’apogée du Romantisme du quatorzième siècle. Le Cantus—la seule partie qui comporte un texte—est une vaste mélodie à la fois par sa longueur et par sa largeur; elle couvre régulièrement une dixième ou une onzième en quelques mesures, distance reconnue par des théoristes du quatorzième siècle tels que Jacques de Liège comme la limite praticable (sinon absolue) de la voix humaine. Les trois autres parties ont un caractère très vocal ou, selon la terminologie contemporaine, «dicibilis» (littéralement «prononçable»). L’essence de la réussite de Solage dans ce morceau réside dans le fait que les parties sans texte semblent tendre vers la beauté et l’aisance de la mélodie de style Cantus. Existe-t-il des signes montrant que des compositeurs médiévaux avaient reconnu que la fin du quatorzième siècle avait produit des compositeurs d’un esprit inventif prodigue—des musiciens qui ajoutaient une trace d’étrangeté à la beauté? La plus sûre indication que les compositeurs du quinzième siècle avaient reconnu que quelque chose de remarquable s’était passé dans le passé recent se trouve dans les sortes de morceaux qu’ils choisirent de reproduire eux-mêmes. L’étendue très contrôlée et le langage harmonique de chansons comme Je requier a tous amoureux de Dufay, Las, que feray? Ne que je devenray? du même compositeur ou Je voel servir plus c’onques mais de Gilet Velut sont caractéristiques d’une grande partie de la musique séculaire du début du quinzième siècle et peuvent être interprétés comme une réaction contre la luxuriance des compositeurs de la fin du quatorzième siècle comme Solage. Quand nous considérons une composition de maturité des années mi-1430, la Tota pulcra es, amica mea de Johannes de Lymburgia, nous trouvons une technique de quatre parties tout à fait différente de celle de Solage. L’harmonie de Lymburgia est rigoureusement contrôlée de sorte que presque toutes les sonorités verticales sont des consonances, les tierces et les sixtes sont des composants décisifs de la musique et de brefs silences sont introduits dans la texture pour éviter des couleurs dissonantes que les Romantiques médiévaux auraient hautement prisées. The performances recorded here are based upon two principal assumptions. These are: (1) that the textless lines in fourteenth-century polyphony should not, save in exceptional circumstances, be texted, but should rather be vocalized or (less frequently, perhaps) performed upon instruments; and (2) that the partial texting increasingly found in the sources after c1400 should often be respected in performance and regarded as evidence for a cappella performance. Thus, in Johannes de Lymburgia’s Tota pulcra es, amica mea, the partial texting in the Tenor and Contratenor (at the words ‘Veni, veni’, for example) is preserved here; the singers momentarily abandon their vocalization to sing the underlay and then return to vocalizing. Since this recording was made these assumptions have been further strengthened by new research. This recording embodies the results of our experiments with vocalization. Using this technique one must find a vowel sound that keeps the textless parts bright but which does not overwhelm the changing vowel sounds of the texted part(s). For French music of the later Middle Ages the vowel in the Middle (and Modern) French tu seems ideal. It is strong in high harmonics and therefore bright. It is not tiring to produce over long periods (in contrast to the vowel in British English cool, for example). The first, second and third formants of the vowel in tu are relatively widely spaced and therefore it is not an inherently loud vowel (in contrast to the stem vowel in British English father, for example), and for the same reasons it is not inherently dark. It therefore exerts the minimum masking effect upon the changing vowels of the texted voice while retaining the brightness that is central to the aesthetic effect of this repertory. Deux hypothèses principales forment la base des interprétations qui sont enregistrées ici. Ce sont: (1) que les lignes sans texte de polyphonie du quatorzième siècle ne devraient pas, sauf dans des cas tout à fait exceptionnels, recevoir de texte, mais devraient plutôt être vocalisées ou (moins fréquemment peut-être) être exécutées sur des instruments; et (2) que l’apparition de texte partiel que contiennent de plus en plus les sources après environ 1400 devrait souvent être respectée dans l’interprétation et considérée comme l’évidence d’une interprétation a cappella. Ainsi, dans la Tota pulcra es, amica mea de Johannes de Lymburgia, le texte partiel dans le Ténor et Contraténor (aux paroles «Veni, veni», par exemple) a été préservé dans notre enregistrement; les chanteurs abandonnent pour un temps leur vocalisation pour chanter les paroles écrites sous la musique, puis retournent à la vocalisation. Ces hypothèses ont été encore renforcées, depuis que cet enregistrement a été fait, par une recherche publiée récemment. Cet enregistrement exprime le résultat de nos expériences avec la vocalisation. En se servant de cette technique, il faut trouver un son de voyelle qui conserve la clarté des parties sans texte mais n’en submerge pas les sons changeants des voyelles de la (les) partie(s) avec texte. Pour la musique française de la fin du Moyen Age la voyelle u dans le mot «tu», en français médiéval (et moderne) semble parfaite. Elle est forte dans les harmonies aigües et donc claire. Elle n’est pas fatigante à produire pendant de longues périodes. Le premier, deuxième et troisième formants de la voyelle dans «tu» sont relativement bien espacés et ce n’est donc pas une voyelle fondamentalement haute, et pour cette même raison, elle n’est pas fondamentalement sombre. Elle exerce donc un effet masquant minimum sur les voyelles changeantes de la voix chantant le texte tout en conservant la clarté qui est le centre même de l’effet esthétique de ce répertoire.